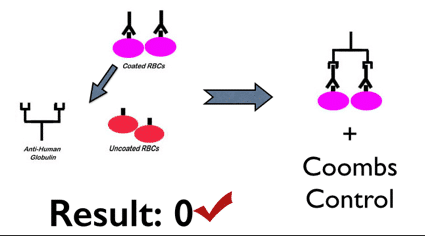 An unofficial term for the antibody-coated red cells used as a quality control measure for negative indirect or direct antiglobulin tests performed in test tubes (the cells are more formally known as “Coombs Control” cells or even more properly as “IgG-coated RBCs”). When a IAT or DAT is negative, the anti-human globulin (AHG) reagent is free in the tube (it did find any coated RBCs with which to bind). RBCs already coated with antibody are added (left side of figure). The free AHG should attach to the IgG-coated check cells and give visible agglutination after centrifugation (right side of figure). This required step ensures that the AHG reagent was added and is working properly. Check cells get their name from the fact that when they are added and agglutination is seen as expected, workers indicate that fact by placing a “checkmark” next to the “0” that they wrote down for the negative reaction. NOTE: To see how this looks in practice, go to the video page on this site and watch “Antibody ID, part 1” from 16:00 to 19:00 in the video).